Traditional candies that don’t resemble anything other than, well, candy, might still taste good, but everyone loves candy that is colored and shaped to look like real-world objects. After all, it’s exciting to eat gummies that look like body parts or chocolates in the shape of antique cars. Chocolate coins are another candy favorite in this area. These have been around for a while, but they remain popular because they are not only tasty, but fun. Penny candy makes a great gift for a variety of holidays. Give someone a few bags of chocolate pennies for New Year’s to wish them good fortune in the coming year. Chocolate gold quarters or half dollars are also an appropriate gift for St. Patrick’s Day, as you deliver the gold at the end of the rainbow to all your family and friends. People love removing the gold foil and then enjoying the creamy milk chocolate coins inside. And don’t forget the end-of-the-year holidays, too. 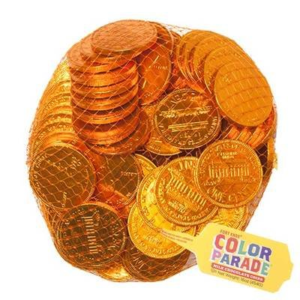 Chocolate penny candy will be especially popular at Halloween, when you can give trick-or-treaters the gift of riches and chocolate at the same time! Of course, you don’t need to wait for a holiday to gift fun penny candy to someone. Chocolate coins are great for supplementing birthday gifts. Place a few in a birthday card or a small gift bag, since everyone loves a sweet treat now and then. Penny candy has lots of fun uses. You can order yours today from BlairCandy.com.